“Food security”, despite what you may think, doesn’t actually refer to whether your household food supply is safe from thieves and grizzly bears. No, it actually refers to whether your food supply is sufficient enough to prevent starvation, which is a constant threat in the post-zombocalypse world of Rebuild. When you first start a new city in Rebuild: Gangs of Deadsville, you’ll find yourself in possession of a bright-eyed group of four survivors, but very little to feed them with. One of the most important tasks early in a new game is to achieve a state of food security; that is, to start bringing in at least as much food as your Hungry, Hungry Survivors are putting away. Like the previous games in the series, the most reliable source of food for your survivors are farms. 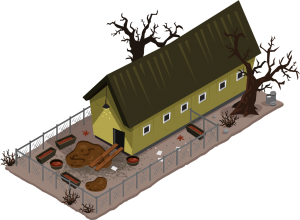 Unlike previous games in the series, however, farms in Rebuild: Gangs of Deadsville come in a few different sizes and shapes. Regular 1×1 Farms produce 1 unit of food per day, while 1×2 Big Farms produce 1.5 units, and 2×2 Huge Farms produce 3 units of food per day. 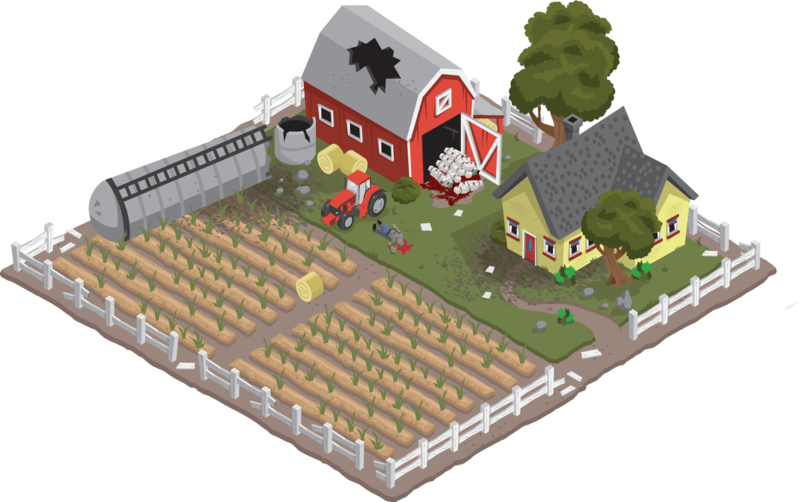 * Farms produce food for your crew automatically, but you can also assign a survivor to work a farm to double its output. Since a survivor consumes 1 unit of food per day, having someone work a farm produces at least enough extra food to feed the worker, and in the case of a Huge Farm can produce an accordingly huge surplus! For that reason, and since you can only ever construct regular sized Farms yourself, you should definitely seek out and try to reclaim any Big and Huge Farms you happen to see near your base. That’s not the only way to get juicy units of food to cram into your survivors food unit-holes, of course. Hunting for wild animals in Fields and fishing in the ponds of Parks are also good sources of food, but can be a bit unreliable. Of course, if you’re starving and have a survivor to spare, why not try scavenging for goodies in a nearby apartment block, or trading materials to a wandering merchant in exchange for food? Wait, we haven’t talked about either of those things yet? Well, I suppose you’ll have to wait until next time… or you can find out for yourself right now by picking Rebuild: Gangs of Deadsville up on Steam Early Access! * These numbers are, of course, subject to change as we tweak the game’s difficulty. If you’re a food production number enthusiast, be sure to keep an eye on the official wiki’s Food and Farming pages for updated information!